Matrix Time-Attendance systems offer state of the art, highly advanced, automated Time attendance systems which records attendance data of a user and generates various reports for further action. It not only saves administrative cost but also facilitates HR to centrally manage attendance policies from multiple locations. HR can easily utilize the software for employee review, appraisals or monthly salary calculation. Automatic calculation of overtime, leave balance, enables managers to work efficiently. Its standalone or network based operation is ideal for schools, hospitals, government institutes, banks, remote sites, hotels, small/large enterprises and many more. 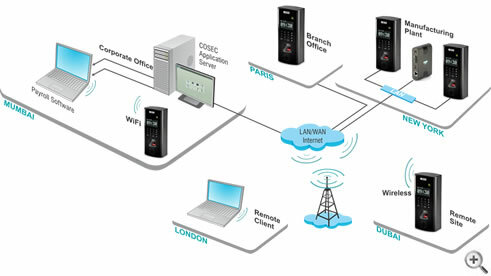 Irrespective of the number of devices and the branches, Matrix Time Attendance systems are centrally managed time attendance system that can be remotely monitored across multiple locations without VPN connectivity. Matrix also offers Wi-fi based Time attendance system and 3G based Time attendance systems to meet the demand of remote site attendance monitoring without internet connectivity. Matrix Palm Vein reader (PVR) Time attendance and access control systems provide a high level of security and also addresses hygiene issues especially for enterprises where the reader is exposed to the usage by a very large crowd. The touchless interface makes Matrix Palm vein reader the best choice time attendance and access control for hospitals, hotels, schools, universities, government and corporate enterprises. The touchless Palm Vein Reader is also an ideal device for Oil field and industrial environment, where touching the device again is not feasible due to dust , grease or any skin conditions. Businesszone is an authorised Matrix distributor in Dubai and offers rigid, robust, reliable time attendance systems and access controls systems.